Just like human beings, putting in weight is essential for your dogs. Usually, a healthy weight is an indicator that your dog’s well being is at a good place. This is also most especially true if your dog happens to be an active dog. Unfortunately, there are some dogs who have trouble putting in weight. In addition to that, some dogs are also having a but of a struggle with putting in muscle. However, both weight and muscles are essential in ensuring that your dog stays a strong and healthy dog. But worry not, here in this article, I have rounded off the top five best dog food to gain weight and muscle. Your dog will achieve that healthy weight, in no time! Great Plains Feast is one of the most premium dog food brands that allows your dog to get an all inclusive but grain free dog food. It offers your dog the chance to have a source of lean protein. With that being said, the Earthborn Holistic main and number one ingredient for protein is a lean red meat bison meal which makes this fog food a high protein meal. This is mostly ideal if you are looking forward to bulking up your dog with muscles. In addition to the red meat bison meal, this dog food also entails lamb meal and egg protein, which as most of you know is truly one of the most effective sources of protein for muscle growth. Another thing I truly liked about this is that it comes with a balanced mix of protein and carbs. 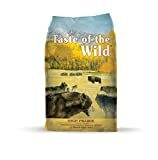 Dog food by Taste of the Wild is another premium dog food. One thing you will surely appreciate about this dog food is that it is a premium mix of a variety of natural ingredients. This Taste of the Wild is composed of authentic and real roasted meat, authentic fruits as well as vegetables. In addition to these, this dog food comes with a selection of salmon, venison, bison, lamb and boar among many others. This ensures that your dog will be able to bulk up in a healthy manner. Aside from this, this dog food also comes with different antioxidants. This helps your dog maintain a healthy and even a shiny coat and skin. This also helps him or her have a better immune system which will prevent any possibly chances of being inflicted with a disease that may otherwise cause your dog to stop eating. 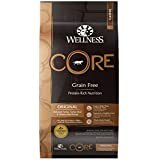 If bulking up on muscles is your number one priority for your dogs, then this Dog Food by Wellness CORE may be the one for your dog. The Wellness CORE prides itself as an all natural dog food. It does not come with any grains which is actually good because grains also have the reputation for being a common allergen among dogs. In addition to a good and balanced blend of premium sources of protein, this dog food also contains a selection of different nutrients which include natural salmon oil, veggies and fruits that are fortified with nutrients. This further provides your dog with support that he or she will need in order for him or her to gain weight. All in all, this dog food promotes lean muscle growth, high level of energy and overall immune system condition. 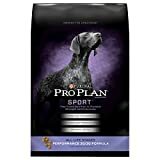 Next on the list we have the dog food by Purina Pro Plan. This dog food comes with a content of concentrated nutrition. In turn, this will maximize your dog’s oxygen metabolism. In addition to this, this dog food comes with a big amount of amino acids. These amino acids will surely aid in the nourishing of your dog’s muscles. This works pretty well if your dog is exercising. This makes sure that your dog will be able to bulk up while still eating healthily and with less chances of your dog getting injured. Furthermore, you will also see a significant improvement in the energy level of your dog. Aside from the energy levels, you will also see a significant increase in the level of endurance of your dog. Merrick has always prided itself as a premium brand that offers a high protein dog food that only uses natural substances. 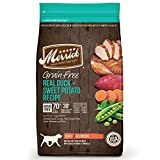 Aside from being an all-natural dog food, this dog food also contains a whopping amount of 70% protein or meat as well as 30% of fresh and natural produce. This ensures that your dog will be able to gain weight, bulk up on muscles without sacrificing on the veggies and fruits aspect. In addition to this, this dog food also includes a high level of elements like glucosamine and chondroitin which are both helpful in ensuring that your dog will have healthy bones and joints. In addition to this, it has good sources of carbs such as sweet potatoes. So first, find out if your dog is underweight. Keep in mind that this can depend on a lot of factors. Some considerations to think are the breed, the number of activities your dog does and the age. If your dog has some ribs, shoulder or hips that are very visible. Most especially, some breeds really do have a low amount of fat reserves in the aforementioned areas. If your dog is now a senior now or is already approaching the border to becoming a senior, then you may start to notice that he or she is already losing muscles and having a significant drop in level of weight. You may consider bulking him or her up just to ensure despite age, they will still stay healthy. If their energy levels seem to be low or less than the usual. This could mean that your dog is going through a specific disorder. I will expound more on this, later on. If the quality of the coat of your dog seems to be bad. This also applies if the coat of your dog seems to shine less now than before. If your dog is unenthusiastic about eating. This is a translation of poor eating habits. In addition to being enthusiastic, this may be a manifestation of your dog being a picky eater. In order to address this issue, you may want to try out different brands and recipes as long as it still contained the necessary amount of nutrients for your dog. The aforementioned points do not necessarily indicate that your dog is confirmed to be underweight. But once you have noticed these things, you should start to be alert. Although having a low level of weight is bad, it is not the actual disorder, itself. But rather, a low level of weight is actually a symptom that your dog may be experiencing a disorder or a disease. After all, low level of weight is just a manifestation of bad health conditions. Calories are one of the main important elements that can contribute to the weight of your dog. With that being said, your dog needs a whopping amount of 1600 up to an amount of 2200 calories each day. The specific number will of course depend on the breed of your dog but that’s the rough estimation. In addition to a high caloric count, your dog food must also contain a high amount of protein. This is essential in making sure that your dogs will gain enough muscles, as well. This also helps them gain weight in a healthy manner as opposed to just eating fatty foods. Ideally, the dog food must at least have a component of 30% protein. Fats are very helpful in keeping your dog healthy. To be more precise, the ideal dog food must contain the essential fatty acids mainly the omega 3 and omega 6. These fatty acids will surely aid your dog’s coat and give it an extra boost when it comes to shine. 1. Some dogs may have a hard time eating. One sure trick to make sure that your dog will have an easier time eating, your opt to pour hot water in your dog’s food. What this does is that it allows the food to be moister. As a result, it makes it easier for your dog to eat and will thus result in your dog eating more. 2. You may opt to include extra calorie boost to your dog’s food. What do I mean by this? Well, to make sure that your dog will be getting all the necessary amount of calories that your dog will need without overdoing it, you may choose to add some supplements for boost such as powder, tablets among all other additives. 3. Divide your dog’s meals into smaller ones instead of larger divisions. One good way of making sure that your dog can eat more is if you opt to feed him about four to five smaller meals. This is because if you use this tactic, your dog is better able to digest their food as well as metabolize the benefits and nutrition of the food. 4﻿﻿. Bulk your dog up with enough exercise. The common thinking is that if your dog is underweight and if you make your dog exercise, he or she will have a harder time gaining weight. This is wrong. With exercise, specifically a good resistance training taken along with a good diet, your dog will be able to pack in muscles. In conclusion, the best dog food for gaining weight is the Purina Pro Plan Sport Dry Dog Foo﻿d. One of the special and unique features about this is that it comes with concentrated nutrition that allows your dog to maximize his or her oxygen metabolism. Additionally, this dog food comes with amino acids which will also equip your dog with the necessary nutrient to bulk up on muscles. Aside from visible weight gain, you will also see a significant increase in the endurance and energy levels.